Inspired by this link from a friend, I decided to challenge myself for a race for the Oscars. 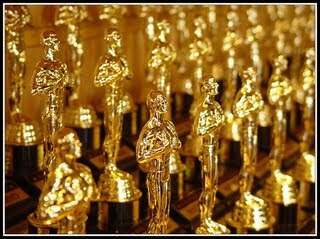 I want to view all the Oscar nominated films before the Academy Awards on March 7. Even though the project is ambitious, I have chosen to limit it a bit so it wont be entirely impossible, so I will only count the films that are nominated in the categories: Best Film, Best Actor, Best Actress, Best Director, Best Supporting Actor, Best Supporting Actress. With this limitation, I only have 13 films left to view before March 7. That should be possible... right?